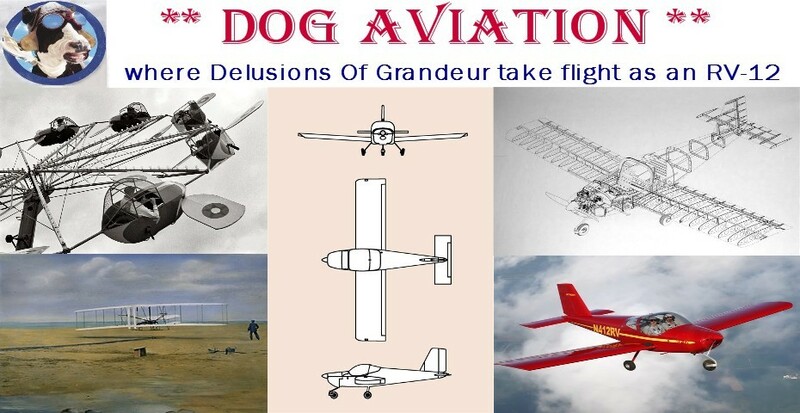 DOG Aviation John's RV-12 Blog: Yes! – We Have Brakes! Yes! – We Have Brakes! Now that the eagle’s propulsion has been squared away, it’s time to work on the claws when returning to terra firma. The brake lines have been installed for quite some time, but the system has not had brake fluid installed yet. In general, aircraft do not use the typical DOT 3 or 4 brake fluids common in automobiles, instead, they use various forms of specialized hydraulic fluid. At DOG Aviation the decision has been made to use Amsoil’s full synthetic ATF fluid for the brakes … it has a very high flash point of 453 degrees F, which is a good thing and actually higher than a few of the recommended aviation hydraulic brake fluids. In a pinch, when on a trip, Moble 1 ATF can be added and it is available at any automotive store on a Sunday afternoon … aviation brake fluid, not so easy to procure on a Sunday afternoon. By no means is this a recommendation to use a non-aviation brake fluid … it is just a decision made for the DOG Aviation RV-12 based on a little research. If the decision turns out to a bad one, I’ll return from the future and edit this post accordingly … but that is not very likely to happen. Purging the brakes on any RV airplane can be problematic because of the crossover brake lines that connect the four master cylinders (two pilot and two co-pilot) together for each of the wheel brakes. The crossover lines tend to be high spots and are prone to capturing air which can be difficult to remove by just pressing on the brake pedals to bleed them. The ultimate method is to use a hand vacuum pump connected to the fluid reservoir on the firewall and pull fluid in from the wheel cylinders or a pressure pump to push fluid… but they are pricey. The second best way is to push fluid up from the wheel cylinders using a hand pump. I elected to try using the hand oiler approach and had acceptable results once I got the hose attached to the oiler to stop leaking. (Suppose a small pump-up garden sprayer would work even better). I was thinking of making a small pressure vessel out of a quart Mason jar if the oiler did not work. When using the hand oiler, care must be taken to not pump more than about half the fluid out of the container …. this allows for the top to be unscrewed and the pump moved aside so the tank can be topped off again without lifting the pump out of the fluid which will induce air into the pump. Pumping fluid into the brake bleeder valve using a large hand pump oiler. It would have been nice if the oiler squirted a larger volume of fluid per pump, but it did work OK and got the job done. At the brake fluid reservoir on the firewall a ¼" threaded fitting was connected to a vinyl hose to collect the excess fluid. I would have preferred using a barbed fitting but my local big box store did not have any with ¼" pipe threads so a hose was slipped over the threads, which of course leaked … but that is not a big deal at the reservoir end because the hose is only for collecting the fluid. At the brake fluid reservoir on the firewall a ¼" fitting was screwed into the reservoir and connected to a vinyl hose to collect the excess fluid. The use of a ¼" NPT to barbed fitting would be preferable here as opposed to the ¼" NPT to ¼" NPT fitting that was used. While performing the purge, the bleed valve on the caliper can be left open while vigorously pumping the oiler ... however, a hand should be kept on the vinyl tubing to keep it from popping off the fitting while pumping and making a big mess (ask me how I know).